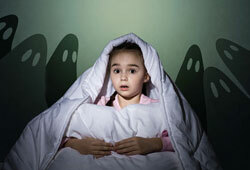 Home » Nightmare Interpretation » What You Need to Know about Foods that Cause Bad Dreams at Night? Though scientists are still not completely sure of the relationship between dream and eating before bed, it is clear that eating close to sleeping can decrease the restfulness of your sleep. Wondering what are foods that cause bad dreams at night? Some studies show that you should especially avoid heavy meals, spicy foods, or anything likely to create indigestion if you don’t want your peaceful sleep to be interrupted. Did your parents ever tell you not to eat candy before go to sleep because it would cause nightmares? Well, it turns out that was not just a scare tactic. Not candy particularly causing horrible dreams, but eating before bed generally can lead to a problem – wolfing down food before hitting the hay will mess with your ability to sleep and, of course, potentially induce nightmares. We all do like a little nighttime nosh, yet what you decide to nibble on may affect terribly to how well you sleep. Why Can Food Affect Dreams? What Foods to Avoid before Bed? According to scientists, your metabolism revs up to digest the food when you are eating; this, in turn, causes your body temperature to rise. 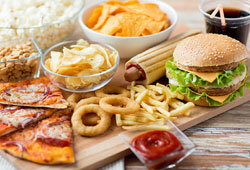 The process of digestion increases brain activity, which will interrupt a normal sleep pattern. The effects of the brain activity can disturb the REM (rapid eye movement) part of sleep, where most dreams and nightmares happen. REM usually occurs when your eyelids begin to flutter and your muscles relax because the brain is active. In order to stop bad dreams, we advise you not to eat foods that are hard to digest. So does eating before bed cause bad creams? We discovered that either particular foods or eating late at night can somehow influence our dream. All the foods which are mentioned earlier are studied causing both disturbing and bizarre dreams. From now on, you should avoid using dairy (cheese, milk, and ice cream), spicy foods, and sweet foods right before go to sleep. Further, eating late was commonly associated with nightmarish and bizarre dreams. Can foods give you nightmares? What are foods that cause bad dreams? 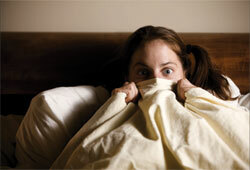 One sleep study in a Canadian university showed that, of 389 subjects, 8.5% blamed bouts of horrible dreams on food. Avoid eating spicy stuff, junk food, and anything triggering brain waves if you want to enjoy a restful night.